Down The Rabbit Hole is an eclectic collection of facts and activities, primarily aimed at students and teachers. This site used to be known as "North Of Sepo", so-named because I was teaching at several schools in the northern suburbs of Geelong. Sadly, it has been inactive for many years, but the time has come to breathe new life into it. Warning! Material is being moved around and updated. Don't be surprised if you find something that doesn't look quite right, or links that are broken. 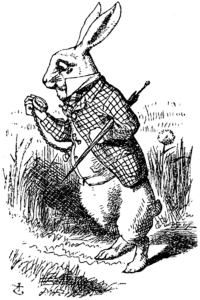 Why "Down The Rabbit Hole"
Education is a tricky beast. When something grabs our interest, we may pursue some crumb of knowledge, which leads to another, which leads to another, and then… we may find ourselves quickly straying away from the actual task at hand. Students often ask me questions about a range of things, and I am happy to oblige. A student once asked me about some aspect of Geometry, which led to the concept of dimensions, which led to tesseracts and other four-dimensional objects. He was fascinated, but he immediately said "Oh! Another rabbit hole for me to fall down", acknowledging that he could get lost in a never-ending trail of fascinating facts and ideas, whilst not doing his actual school-work. Learning, exploring, creating, inquiring… these are dangerous things. They distract us from more mundane tasks, and make us question how and why we do things. Jump down the Rabbit Hole, if you dare. Ask questions here about surds! If you cannot see coloured balls bouncing in a box above, try using Apple Safari, Mozilla FireFox or Google Chrome… all free downloads!